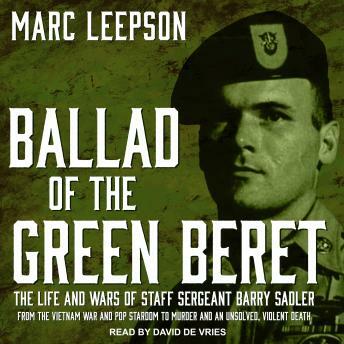 The top Billboard Hot 100 single of 1966 wasn't The Rolling Stones' 'Paint It Black' or the Beatles' 'Yellow Submarine'-it was 'The Ballad of the Green Berets,' a hyper-patriotic tribute to the men of the Special Forces by Vietnam veteran, US Army Staff Sergeant Barry Sadler. But Sadler's clean-cut, all-American image hid a darker side, a Hunter Thompson-esque life of booze, girls, and guns. Unable to score another hit song, he wrote a string of popular pulp fiction paperbacks that made 'Rambo look like a stroll through Disneyland.' He killed a lover's ex-boyfriend in Tennessee. Settling in Central America, Sadler ran guns, allegedly trained guerrillas, provided medical care to residents, and caroused at his villa. In 1988 he was shot in the head in Guatemala and died a year later. This life-and-times biography of an American pop culture phenomenon recounts the sensational details of Sadler's life vividly but soberly, setting his meteoric rise and tragic fall against the big picture of American society and culture during and after the Vietnam War.